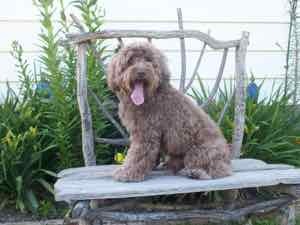 Our boys are available as stud dogs to approved labradoodle breeders. 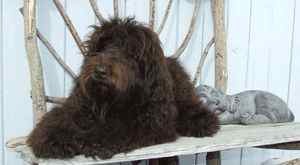 Paddington has the softest coat, a beautiful soft wool that will produce lovely puppies. He is a sweet little boy that we are lucky enough to now co-own with Karen McKay of Canadoodles. He is the father of our newer stud Cagne. We are so happy to have him as part of our Over The Moon family. Cagne has OFA good hips and OFA Normal elbows. He passed his annual eye test and is PRA clear. Joey is the planned sire for Lexi’s last litter of puppies. 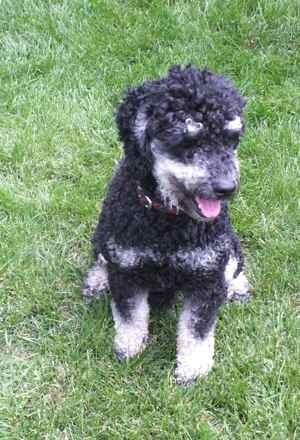 Joey was bred by GorgeousDoodles. Last year we had the dearest chocolate puppies with Lexi and Joey and we are planning to have one more litter with the two of them before Lexi retires. Joey’s hips are OFA fair, his elbows normal and his eyes tested as normal. Cagne is an enthusiastic boy that we co-own with Karen McKay of Canadoodles. He lives with his mum Elaine here in Grand Forks. He has just had his first litter with us and they are beautiful. We are so pleased with him. Size: 15 inches at the shoulder and he weighs 22 pounds. Cagne has OFA good hips and has shown to be clear of common genetically carried conditions. Barnaby has given us a beautiful girl, Tia Caleche to carry on his line. Barnaby is living happily with his family here in Grand Forks. 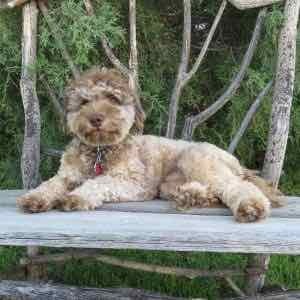 Chester came to us as a puppy from Melanie Ann Derwey of Gorgeous Doodles and he was a charmer right from the start. 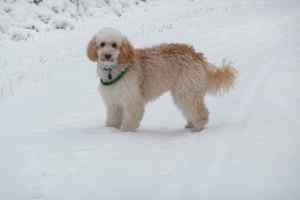 The Perry family adopted Chester and he is very happy in his beautiful country home not far from us. Chester has always been a bright light and has produced lovely puppies for us.